Dario Castello remains one of the most mysterious of composers: beyond a couple of references to his name on the title pages to his published works there is no record of his life; it has even been suggested—albeit inconclusively—that the name is an anagram. Yet his music offers clear testimony to his creative skills. The 1621 volume, which comprises twelve works, presents the first ever collection devoted entirely to instrumental sonatas; likewise, the seventeen pieces published in 1629 are also exclusively sonatas. Castello takes elements of the traditional multi-voiced Venetian canzona, not least passages of virtuoso solo writing and of concertante exchanges between several players, and successfully introduces them into extended works. Much more is known of the life of Giovanni Picchi. He was a fine harpsichordist, organist of several Venetian churches and institutions, and a noted performer and composer of dance music. The works on this recording are as innovative and varied as this heritage would suggest. Intrigue and mystery were upheld as virtues by the inhabitants of early-seventeenth-century Venice, practised and refined by high and low alike and elevated to an art form by the city state’s secret police. A contemporary wood carving by Francesco Pianta, among the treasures of the Scuola di San Rocco, highlights the furtive qualities of a typical Venetian spy, his identity fully concealed beneath cloak and hat. It is a neat irony of La Serenissima’s history that details of Dario Castello’s life remain obscure, despite the extant wealth of archival evidence on musicians whose own compositions fall short of his cultivated, forward-looking works. The name Castello was, and is still, common in Venice; indeed, there appears to have been a family of musicians who served the Doge and other Venetian employers in the first half of the seventeenth century and perhaps earlier. Payment and census records, contracts and necrologies from the period refer to three Castello instrumentalists who were almost certainly related: Bartolomeo, Giovanni Francesco and Giovanni Battista. The last of these was engaged as a member of the Doge’s six-strong team of piffari, or wind players, from 27 December 1624 to 15 November 1633, noted in the San Marco archives as son of ‘Dario of Venice, musician in our aforementioned chapel’. The evidence of Castello’s music and its publication history offer clear testimony to his creative skills and stature as a composer of considerable influence. The 1621 volume, which comprises twelve works, presents the first ever collection devoted entirely to instrumental sonatas; likewise, the seventeen pieces published in 1629 are also exclusively sonatas. 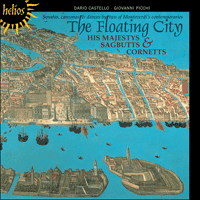 Here Castello takes elements of the traditional multi-voiced Venetian canzona, not least passages of virtuoso solo writing and of concertante exchanges between several players, and successfully introduces them into extended works for fewer instruments. Although these sonatas are cast in one continuous ‘movement’, Castello introduced clear tempo marks, such as adasio, alegra or alegro and presto, to highlight formal subdivisions and contrasting affects. Sonata No 8 from Book II, for example, contains six changes of tempo indications or metre. This work is typical of the marriage of old and new, the imitative counterpoint of its opening section recalling the canzonas of Giovanni Gabrieli, the pervading virtuosity and expressive central Adagio signposting the way towards future developments in Venetian instrumental writing. The slow sections in the magnificent Sonata No 13 from Book II confirm the power of the composer’s melodic imagination, underlined by well-argued points of imitation and eloquent suspensions, with the listener’s attention engaged elsewhere in the work by the sheer variety and virtuosity of the writing. If Dario Castello was employed at San Marco at some point after the publication of his Book I and before the initial typesetting work on his Libro secondo in September 1627, it is likely that he would have worked with and known the Basilica’s maestro di cappella, Claudio Monteverdi. The two composers occasionally share common musical characteristics, with Castello adopting the dramatic repeated notes and tremolo effects of the stile concitato or ‘agitated style’ in several of his instrumental works and, like Monteverdi, calling on the bassoon to emerge from the continuo ranks to perform short solos. The bassoon or dulcian, an important and well-regarded member of Venice’s wind bands, is specified in several of Castello’s sonatas. His affection and respect for the instrument can be heard in the virtuoso passages he created for it, not least in Sonata No 8 from Book II, where it engages in contrapuntal dialogue with and matches the bold writing for cornett. Castello took care to specify the instrumentation or possible permutations of instruments in many of his sonatas, with cornetts and violins prescribed for the treble lines, accompanied by a choice of sackbuts, bassoon and basso continuo instruments. Sonata No 14 from Book II closes with a fantasia-like final slow section, dramatic in its dovetailed part-writing for two cornetts and two sackbuts. Contrasts between treble and bass instruments are intelligently exploited in this sonata, its free-flowing duos and buoyant fugato motifs strikingly vocal in style. It is in the Sonata No 17 from Book II that Castello reveals his shrewdest handling of instrumental texture, pairing two cornetts and two violins and calling on one from each pair to serve as a subordinate echoing voice. The performing edition used for this recording elects to omit the basso continuo part’s upper stave, which, in the original publication, bears a simplified version of lines played by the two treble instruments. The antiphonal effects present in earlier large-scale Venetian instrumental canzonas are here distilled into a work of chamber or private chapel proportions, grand in conception and yet intimate in expression. A comparable balance between soloistic display and ensemble intimacy is struck in the three-part Sonatas Nos 10 and 11 and the two-part Sonata No 5, all from Castello’s Libro secondo. Although Giovanni Picchi’s accomplishments as a composer are overshadowed by those of his contemporary Castello, his career can at least be charted in outline thanks to the survival of archival and other primary evidence. Picchi spent most of his working life in the San Polo district of Venice, where he also helped raise six children, serving as organist at the church of Santa Maria de’ Frari from around 1606 until his death on 19 May 1643. In 1623 he succeeded the recently deceased Giovanni Battista Grillo as organist of the neighbouring confraternity of the Scuola Grande di San Rocco, a post formerly occupied by Giovanni Gabrieli. The organist’s duties at the scuola were recorded in 1588, with incumbents expected to attend Mass and Vespers on twenty-four feast days; Mass on the first Sunday of each month, excluding Advent and Lent; Vespers every Sunday and Compline every Friday. Picchi would also have been expected to organize musicians to represent the scuola in the city’s elaborate ducal trionfi or processions. In 1624 he was invited to compete for the post of second organist at San Marco, although the basilica’s lord procurators decided to elect Giovanni Pietro Berti instead. Before he assumed the responsibilities of a musician in service of church and scuola, Picchi became established as a successful composer and performer of dance music. An engraving on the title-page of Fabritio Caroso’s dance tutor of 1600, Nobilità di dame, shows Picchi playing the lute in consort with three other players; he was also known as a fine harpsichordist. The Toccata, a work of improvisatory élan, was inaccurately copied by Francis Tregian the younger to become part of the Fitzwilliam Virginal Book and must date from before his death in 1619. The circumstances and route of the work’s transmission from north Italy to Tregian’s cell in London’s Fleet Prison, where he compiled the Fitzwilliam anthology, are uncertain, although it appears that the copyist was supplied either with a corrupt version or misconstrued Picchi’s original notation. For this recording, Timothy Roberts has followed the precedent set by Howard Ferguson’s edition of the Fitzwilliam Virginal Book in correcting obvious errors and recasting the Toccata’s final section to close in the key of D rather than in Tregian’s less satisfactory G.
Caroso cited Picchi among the ‘professori di ballare’ in his influential tutor, an attribution confirmed in the late 1610s with the publication of the composer’s Intavolatura di balli d’arpicordo. The original edition has not survived although its contents are known through the 1621 Venetian reprint. Picchi failed to honour his dedicatory promise to supply the volume’s readers with another ‘four books of dances which I shall have printed when I see that this first book proves pleasing to the public’. Perhaps the market for domestic keyboard music was not sufficiently strong in early-seventeenth-century Venice to support such an ambitious series. Whatever the case, Picchi’s published balli include a number of attractive, often adventurous pieces, so-called Polish, German and Hungarian suites among them. The Ballo Ungaro, here performed on harp, delivers an artless, unforced treatment of a bi-partite dance complete with graceful attendant variations. In the Padoana ditta la Ongara Picchi makes use of a ground bass built from three distinct yet similar motifs above which he displays his talent for crafting rapid and appealing divisions. The ‘Hungarian’ provenance of both pieces is unclear although it is tempting to imagine the Padoana’s rhythmic energy adding life and exotic passion to the Carnival shenanigans described by Evelyn. Four years after the publication of the Intavolatura’s second edition, Picchi’s Canzoni da sonar con ogni sorte d’istromenti was issued in Venice, its contents printed in nine partbooks and most probably destined for church performance. These instrumental works are arranged in five groups, for two, three, four, six and eight parts with basso continuo. For no obvious reason the final composition in each group is given the title ‘sonata’, despite retaining the formal and stylistic features of their companion canzonas. Sectional subdivisions are marked in these works not by tempo indications after the manner of Castello but by straightforward changes from duple to triple metre or vice versa. Picchi prescribed the instruments to be used in many of his canzonas, creating a number of interesting combinations such as the four sackbuts and two violins employed in Canzon No 15, a work confusingly styled as ‘sonata’ in a few of the partbooks. The composer’s sackbut writing is especially appealing in its richness here and in the eight-part Canzon No 17. In this recording the latter work, for two instrumental choirs, has been transposed down a fourth from its written pitch, as may have been intended by its configuration of so-called ‘chiavette’ clefs. (For an explanation of clefs and further information on transposition cf. Arthur Mendel: ‘Pitch in western music since 1500: A re-examination’, Acta Musicologica, 50 (1978), 58–62) Aspects of the Gabrielian canzona rise to the surface in this work, notably the simple homophonic exchanges that give character to the triple-metre sections, the antiphonal writing that pervades the entire composition and the ‘quilt-like’ disposition of its often short contrasting sections. Another speculative treatment has been applied here to the Canzon No 18, which appears in the 1625 publication as a work for two four-part choirs. Keyboard transcriptions of polyphonic compositions were routinely made throughout the Renaissance and well into the seventeenth century, while the availability of more than one organ in the wealthiest Venetian chapels and churches of the period contributes further to the legitimacy of arranging the penultimate canzona from Picchi’s book for two organs. The basso continuo part of the six-part Canzon No 14 has also been subdivided between two organs, underpinning the contrasts created by Picchi’s combination of two cornetts and sackbuts. L’intrigue et le mystère, tenus pour des vertus par les Vénitiens du début du XVIIe siècle, étaient pratiqués et parfaits par les petites comme les grandes gens, et en art érigés par la police secrète de la cité. Une sculpture en bois de l’époque, due à Francesco Pianta et comptant parmi les trésors de la Scuola di San Rocco, souligne le caractère furtif d’un espion typiquement vénitien, à l’identité complètement dissimulée sous une cape et un chapeau. Ironie de l’histoire de La Serenissima: les détails de la vie de Dario Castello demeurent obscurs, malgré la profusion d’archives sur des musiciens dont les compositions sont loin d’égaler les œuvres cultivées, tournées vers l’avenir, de cet artiste. Castello était, et demeure, un nom répandu à Venise, il paraît, en effet, y avoir eu une famille de musiciens qui servit le doge et d’autres employeurs vénitiens dans la première moitié du XVIIe siècle, voire auparavant. Les annales de paiement et de recensement, les contrats et les nécrologies de l’époque font référence à trois instrumentistes nommés Castello, très certainement parents: Bartolomeo, Giovanni Francesco et Giovanni Battista. Membre des six piffari (vents) du doge du 27 décembre 1624 au 15 novembre 1633, ce dernier fut consigné, dans les archives de San Marco, comme le fils de «Dario de Venise, musicien en notre susnommée chapelle». La musique de Castello et l’historique de sa publication attestent avec évidence des talents créatifs du musicien et de sa stature de compositeur considérablement influent. Le volume de 1621, qui réunit douze œuvres, offre le premier corpus exclusivement consacré à des sonates instrumentales; à l’identique, les dix-sept pièces publiées en 1629 sont toutes des sonates. Castello prend des éléments de la canzona vénitienne traditionnelle à plusieurs voix—en premier lieu, des passages d’écriture soliste virtuose et d’échanges concertante entre plusieurs instrumentistes—pour les introduire avec succès dans des œuvres étendues, dectinées à un nombre d’instruments moindre. Quoique ces sonates soient coulées en un «mouvement» continu, Castello introduisit des indications de tempo claires, telles que adasio, alegra ou alegro et presto, pour rehausser les subdivisions formelles et les affects contrastés. Ainsi la Sonate no 8 du Livre II recèle-t-elle six changements d’indications de tempo ou de mètre. Cette œuvre est typique du mariage de l’ancien et du nouveau: le contrepoint en imitation de sa section d’ouverture rappelle les canzone de Giovanni Gabrieli, cependant que la virtuosité omniprésente et l’Adagio central expressif montrent la voie des futurs développements de l’écriture instrumentale vénitienne. Les sections lentes de la magnifique Sonate no 13 du Livre II confirment la puissance de l’imagination mélodique du compositeur, que soulignent des motifs en imitation bien argumentés et des retards éloquents, l’attention de l’auditeur étant retenue, ailleurs dans l’œuvre, par les absolues diversité et virtuosité de l’écriture. Si Dario Castello fut employé à San Marco après la publication de son Livre I, et avant le travail de composition initial de son Libro secondo, en septembre 1627, il connut probablement—et travailla avec—le maestro di cappella de la Basilica, Claudio Monteverdi. Tous deux partagent parfois certaines caractéristiques musicales: Castello adopte ainsi les dramatiques notes répétées et effets de trémolo du stile concitato («style agité») dans plusieurs de ses œuvres instrumentales et fait sortir, à l’instar de Monteverdi, le basson des rangs du continuo, pour de brefs solos. Le basson (dulcian), instrument important et apprécié des orchestres d’instruments à vent vénitiens, est spécifié dans plusieurs sonates de Castello. Son affection et son égard pour cet instrument se retrouvent dans les passages virtuoses qu’il créa pour lui—en premier lieu dans la Sonate no 8 du Livre II, où le basson prend part à un dialogue contrapuntique et imite l’écriture hardie pour le cornet à bouquin. Castello prit soin de spécifier l’instrumentation ou les possibles permutations instrumentales dans nombre de ses sonates, qui voient les cornets à bouquin et les violons prescrits aux lignes aiguës, accompagnés par un assortiment de saqueboutes, basson et instruments jouant la basse continue. La Sonate no 14 du Livre II s’achève sur une section finale lente, de type fantaisie, dramatique dans sa conduite des parties concordante, pour deux cornets à bouquin et deux saqueboutes. Les contrastes entre les instruments de tessitures aiguë et grave sont intelligemment exploités dans cette sonate, dont les duos en mouvement libre et les motifs fugato allègres sont de style étonnamment vocal. La Sonate no 17 du Livre II révèle le plus astucieux traitement de la texture instrumentale réalisé par Castello, qui apparie deux cornets à bouquin et deux violons, recourant à un instrument de chaque paire pour servir de voix en écho subordonnée. L’édition utilisée pour le présent enregistrement choisit d’omettre la portée supérieure de la partie de basse continue qui, dans l’édition originale, présente une version simplifiée des lignes jouées par les deux instruments de tessiture aiguë. Les effets antiphonés des canzone instrumentales vénitiennes antérieures, à grande échelle, sont ici distillés en une œuvre aux proportions de chambre ou de chapelle privée, grandiose de conception mais intime d’expression. Un équilibre comparable entre démonstration soliste et intimité d’ensemble survient dans les Sonates nos 10 et 11 à trois parties, ainsi que dans la Sonate no 5 à deux parties, toutes trois extraites du Libro secondo de Castello. Quoique les œuvres de Giovanni Picchi soient éclipsées par celles de son contemporain Castello, l’on peut au moins retracer les grandes lignes de la carrière de ce compositeur grâce, entre autres sources essentielles, aux archives qui nous sont parvenues. Picchi travailla la majeure partie de sa vie dans le district vénitien de San Polo—où il contribua à élever six enfants—, servant comme organiste à l’église de Santa Maria de’ Frari, d’environ 1606 à sa mort, le 19 mai 1643. En 1623, il succéda à Giovanni Battista Grillo (décédé peu avant) au poste d’organiste de la confraternité voisine, la Scuola Grande di San Rocco, naguère occupé par Giovanni Gabrieli. Les fonctions d’organiste à la scuola furent consignées en 1588: les titulaires devaient accompagner la messe et les vêpres de vingt-quatre jours de fête; la messe le premier dimanche de chaque mois, excepté à l’Avent et au carême; les vêpres chaque dimanche et complies chaque vendredi. L’on attendait aussi de Picchi qu’il organisât les musiciens pour représenter la scuola au cours des trionfi ducaux, les processions élaborées de la cité. En 1624, le compositeur fut invité à concourir au poste de second organiste à San Marco, mais les grands procurateurs de la basilique décidèrent d’élire Giovanni Pietro Berti. Avant d’assumer ses responsabilités de musicien au service de l’église et de la scuola, Picchi s’était établi comme compositeur et interprète à succès de musique de danse. Une gravure de la page de titre du manuel de danse de Fabritio Caroso (1600), Nobilità di dame, le représente jouant du luth avec trois autres instrumentistes; il était en outre tenu pour un bon claveciniste. La Toccata, œuvre d’une énergie «improvisatoire», fut inexactement copiée par Francis Tregian fils, qui l’intégra au Fitzwilliam Virginal Book, et doit dater d’avant sa mort, en 1619. Les circonstances et l’itinéraire de la transmission de l’œuvre depuis l’Italie du Nord jusqu’à la cellule où Tregian compila l’anthologie de Fitzwilliam, à Fleet Prison (Londres), sont incertains, même s’il semble que l’on ait fourni au copiste une version altérée ou mal comprise de la notation originale de Picchi. Pour le présent enregistrement, Timothy Roberts a suivi l’édition du Fitzwilliam Virginal Book réalisée par Howard Ferguson en corrigeant les erreurs manifestes et en refondant la section finale de la Toccata afin de terminer dans la tonalité de ré plutôt que dans le sol, moins satisfaisant, de Tregian. Dans son influent manuel, Caroso cita également Picchi au nombre des «professori di ballare»—attribution confirmée à la fin des années 1610 par la publication des Intavolatura di balli d’arpicordo du compositeur. L’édition originale n’a pas survécu mais nous connaissons son contenu grâce à sa réimpression vénitienne de 1621. Picchi manqua à sa promesse dédicatoire de fournir aux lecteurs «quatre [autres] livres de danse qui seront imprimés si je vois que ce premier livre se révèle plaire au public». Peut-être le marché de la musique pour clavier domestique n’était-il pas suffisamment fort dans la Venise du début du XVIIe siècle pour soutenir pareille série ambitieuse. Quoi qu’il en soit, les balli édités de Picchi comprennent un certain nombre de pièces attrayantes, souvent hardies, dont des suites dites polonaises, allemandes et hongroises. Le Ballo Ungaro, exécuté ici à la harpe, propose un traitement ingénu, naturel, d’une danse bipartite accompagnée de gracieuses variations. Dans la Padoana ditta la Ongara Picchi utilise un ground bass construit à partir de trois motifs distincts mais similaires, par-dessus lesquels il montre son talent pour ouvrager des divisions rapides et séduisantes. La provenance «hongroise» de ces deux pièces est obscure, même s’il est tentant d’imaginer l’énergie rythmique de la Padoana en train d’ajouter vie et passion exotique aux manigances carnavalesques décrites par Evelyn. Quatre ans après la publication de la seconde édition des Intavolatura, les Canzoni da sonar con ogni sorte d’istromenti parurent à Venise, imprimées en neuf parties séparées très probablement destinées à une exécution liturgique. Ces œuvres instrumentales sont agencées en cinq corpus, pour deux, trois, quatre, six et huit parties avec basse continue. Sans raison apparente, la dernière composition de chaque corpus reçoit le titre de «sonate», bien qu’elle conserve les caractéristiques formelles et stylistiques des canzone l’accompagnant. Dans ces œuvres, les subdivisions de sections sont marquées non par des indications de tempo, à la manière de Castello, mais par des changements directs de mesure binaire à mesure ternaire et vice-versa. Picchi prescrivit les instruments à utiliser dans quantité de ses canzone, créant un certain nombre de combinaisons intéressantes, tels les quatre saqueboutes et deux violons employés dans la Canzona no 15, une œuvre désignée, de manière confuse, comme une «sonate» dans quelques-unes des parties séparées. L’écriture pour saqueboute du compositeur est—ici comme dans la Canzona no 17 à huit parties—d’une richesse particulièrement attrayante. Dans le présent enregistrement, la Canzona no 17, pour deux chœurs instrumentaux, a été transposée à la quarte inférieure, à partir du diapason écrit, comme le voulait peut-être sa configuration de clefs «chiavette». (Pour une explication des clefs et d’autres informations sur la transposition, cf. «Pitch in western music since 1500: A re-examination» de Arthur Mendel in Acta Musicologica, 50 (1978), 58–62) Des traits de la canzona gabrielienne poignent à la surface de cette œuvre, notamment les échanges homophoniques simples qui prêtent caractère aux sections ternaires, l’écriture antiphonée omniprésente et la disposition «en patchwork» de ses sections contrastées, souvent brèves. Un autre traitement spéculatif a été appliqué à la Canzona no 18, qui apparaît dans la publication de 1625 comme une œuvre pour deux chœurs à quatre parties. Des transcriptions pour clavier de compositions polyphoniques furent régulièrement effectuées tout au long de la Renaissance et jusqu’au XVIIe siècle, cependant que la disponibilité de plus d’un orgue dans les plus riches chapelles et églises vénitiennes de l’époque contribue à renforcer la légitimité de l’arrangement de la pénultième canzona du livre de Picchi pour deux orgues. La partie de basse continue de la Canzona no 14 à six parties a également été subdivisée entre deux orgues, ce qui étaye les contrastes créés par la combinaison de Picchi, savoir deux cornets à bouquin et saqueboutes. Intrigen- und Mysterienspiel galten im Venedig des frühen 17. Jahrhunderts als von arm und reich zu pflegende Tugenden, die dann von der venezianischen Geheimpolizei zur Kunstform erhoben wurden. Eine zeitgenössische Holzschnitzerei Francesco Piantas, einer der Schätze der Scuola di San Rocco, hebt die heimlichtuerischen Züge eines typisch venezianischen Spions mit vollkommen unter seinem Umhang und Hut verborgener Identität hervor. Es ist eine nette Ironie der Geschichte La Serenissimas, daß Einzelheiten über das Leben Dario Castellos im Dunkeln bleiben, und zwar trotz des existierenden Reichtums an Archivmaterial über Musiker, deren eigene Kompositionen nicht an Castellos ausgereifte und nach vorn blickende Werke heranreichen. Der Name Castello war und ist ein durchaus gängiger Name in Venedig. Es scheint sogar eine Musikerfamilie gegeben zu haben, die in der ersten Hälfte des 17. Jahrhunderts, wenn nicht schon früher, für den Dogen und andere venezianische Arbeitgeber gearbeitet hat. Zahlungsbelege, Volkszählungsberichte, Verträge und Totenverzeichnisse aus dieser Zeit erwähnen drei Instrumentalisten mit dem Namen Castello, die mit großer Wahrscheinlichkeit Verwandte Dario Castellos waren: Bartolomeo, Giovanni Francesco und Giovanni Battista. Letzterer war vom 27. Dezember 1624 bis zum 15. November 1633 Mitglied der sechs Mann starken Gruppe von piffari bzw. Bläsern des Dogen und wird im Domarchiv von San Marco als Sohn des „Dario von Venedig, Musiker in unserer obengenannten Kapelle“ erwähnt. Die Existenz der Musik Castellos und ihrer Publikationsgeschichte ist ein deutliches Indiz seiner Schaffenskunst und Stellung als Komponist von bedeutendem Einfluß. Die zwölf Bände umfassende Ausgabe aus dem Jahr 1621 ist die erste jemals veröffentlichte Sammlung musikalischer Werke, die sich allein instrumentalen Sonaten widmet. Die 17 im Jahr 1629 veröffentlichten Werke sind ebenso ausschließlich Sonaten. Für diese Sonaten hat sich Castello Elementen der für Venedig bekannten mehrstimmigen Kanzone bedient, ungeachtet Passagen für Solisten und dem concertante zwischen mehreren Instrumentalisten, und integriert diese erfolgreich in größere Werke für weniger Instrumente. Obwohl die Komposition dieser Sonaten die Form eines kontinuierlichen „Satzes“ trägt, macht Castello genaue Tempoangaben, wie z. B. adasio, alegra oder alegro und presto, um bestimmte Abschnitte und Gegensätze hervorzuheben. Sonate Nr. 8 aus Buch II enthält z. B. sechs Tempo- bzw. Taktänderungen. Dieses Werk ist ein typisches Beispiel für die Verschmelzung von alt und neu, mit seinem nachempfundenen Kontrapunkt in der Einleitung als Anlehnung an die Kanzonen Giovanni Gabrielis und der vollendeten Virtuosität und dem ausdrucksstarken Adagio im Mittelteil, als wegweisende Merkmale für die zukünftige Entwicklung venezianischer Instrumentalwerke. Die langsamen Passagen der großartigen Sonate Nr. 13 aus Buch II sind Zeugnis für die Brillanz Castellos melodischer Vorstellungskraft, unterstrichen durch wohlgesetzte Abschnitte der Imitation und beredter Verzögerung sowie sein Vermögen, die Aufmerksamkeit der Zuhörer anderorts im Werk mittels der bloßen Vielfalt und Virtuosität der Komposition zu fesseln. Wenn Dario Castello irgendwann zwischen der Veröffentlichung von Buch I und den ersten Schriftsetzarbeiten zu seinem Libro secondo im September 1627 in San Marco angestellt war, dann ist es durchaus möglich, daß er den maestro di capella der Basilika, Claudio Monteverdi, gekannt bzw. mit ihm zusammengearbeitet hat. Beide Komponisten verwenden gelegentlich gemeinsame musikalische Merkmale. Castello bedient sich in einigen seiner Instrumentalstücke dramatischer wiederkehrender Notenabfolgen sowie Tremoloeffekte des stile concitato oder „bewegten Stils“; Monteverdi setzt für kurze Solos das Fagott als Generalbaß ein. Das Fagott bzw. Dulzian, ein wichtiges und durchaus gängiges Instrument in venezianischen Bläsergruppen, kommt in mehreren Sonaten Castellos vor. Seine Begeisterung und Leidenschaft für dieses Instrument kommt in den eigens dafür geschaffenen Passagen zum Ausdruck, insbesondere in der Sonate Nr. 8 aus Buch II, wo es unter Anpassung an dessen Ausdrucksstärke mit dem Kornett in kontrapunktischen Dialog tritt. Mit den Kornetts und Violinen für den Sopranpart unter Begleitung einer Auswahl von Posaunen, Fagotts und Generalbässen hat Castello bei vielen seiner Sonaten darauf geachtet, die einzelnen Instrumente hervorzuheben bzw. zu wechseln. Sonate Nr. 14 aus Buch II klingt mit einem langsamen, fantasiaähnlichen Schluß aus und gewinnt durch dessen überlappenden Part für zwei Kornetts und zwei Posaunen an Dramatik. Die Gegensätze der Sopran- und Baßinstrumente werden in dieser Sonate intelligent genutzt, und tragen durch die fließenden Duos und heiteren Fugatopassagen zu einem überaus vokalem Stil bei. In der Sonate Nr. 17 aus Buch II kommt es zu Castellos raffiniertester Instrumentalbesetzung, indem er zwei Kornetts und zwei Violinen kombiniert und jeweils ein Instrument der beiden Instrumentenpaare als untergeordneten Echoton einsetzt. In der für diese Aufnahme gewählten Version wurde auf die oberen Notenlinien für den Generalbaß verzichtet, die in der Originalversion als vereinfachte Variante für zwei Sopraninstrumente dienen. Die für frühe venezianische Kanzonen mit großer instrumentaler Besetzung typischen antiphonalen Effekte werden hier in ein Werk mit kammer- bzw. kapellmusikartigen Abschnitten integriert, das über einen großartigen Entwurf und zugleich vertrauten Ausdruck verfügt. Eine vergleichbare Balance zwischen solistischer Darbietung und der Intimität eines Ensembles zeigt sich in den dreistimmigen Sonaten Nr. 10 und 11 sowie der zweistimmigen Sonate Nr. 5, die alle aus Castellos Libro secondo stammen. Obwohl die Leistungen des Komponisten Giovanni Picchi durch die seines Zeitgenossen Castello überschattet wurden, kann seine Laufbahn dank überlieferten Archivmaterials und anderer Beweismittel wenigstens grob nachgezeichnet werden. Picchi verbrachte den größten Teil seiner Schaffenszeit im San Polo Distrikt von Venedig, wo er unter anderem sechs Kinder großziehen half und in der Zeit um 1606 bis zu seinem Tod am 19. Mai 1643 in der Kirche von Santa Maria de’ Frari Organist war. 1623 übernahm er die Organistenstelle des kurz zuvor verstorbenen Giovanni Battista Grillo in der nahegelegenen Konfraternität der Scuola Grande di San Rocco, einen ehemals durch Giovanni Gabrieli bekleideten Posten. Entsprechend den 1588 dokumentierten Aufgaben für Organisten der Scuola mußten die jeweiligen Amtsinhaber die Messe und Vesper an 24 Feiertagen besuchen; die Messe am ersten Sonntag jeden Monats, ausgenommen zur Advents- und Fastenzeit; die Vesper an jedem Sonntag und die Komplet an jedem Freitag. Picchi war darüber hinaus für die Organisation von Musikern verantwortlich, die die Scuola bei den herzöglichen trionfi (Prozessionen) Venedigs vertreten sollte. 1624 wurde er für den Posten des zweiten Organisten von San Marco vorgeschlagen, die Prokuratoren der Basilika entschieden sich jedoch für Giovanni Pietro Berti. Bevor Picchi seine Arbeit als Musiker im Dienste der Kirche und Scuola aufnahm, hatte er sich bereits einen Namen als Komponist und Interpret von Tanzmusik gemacht. Die Titelseite des Tanzlehrbuches Fabritio Carosos, Nobilità di dame, aus dem Jahr 1600 zeigt Picchi zusammen mit drei anderen als Lautenspieler; er war auch als guter Cembalist bekannt. Die Toccata, ein Werk von improvisatorischem Elan, wurde von Francis Tregian dem Jüngeren falsch in das Fitzwilliam Virginal Book aufgenommen und muß aus der Zeit vor seinem Tod im Jahre 1619 stammen. Die Umstände und auf welchen Weg das Werk von Norditalien in Tregians Zelle im Londoner Fleet Gefängnis gekommen ist, wo er die Fitzwilliam Anthologie verfaßte, sind ungewiß. Es scheint jedoch, daß Tregian entweder über eine gefälschte Version verfügte oder Picchis Originalnotation falsch interpretierte. Für diese Aufnahme hat sich Timothy Roberts nach der Notation in Howard Fergusons Ausgabe des Fitzwilliam Virginal Book gerichtet, der in seiner Ausgabe grobe Fehler korrigiert hat und den Schluß der Toccata in C-Dur ausklingen läßt, und nicht in der weniger befriedigenden G-Dur Version Tregians. Caroso hat Picchi in seinem einflußreichen Lehrbuch unter den „professori di ballare“ genauer erwähnt, eine Bezeichnung, die sich im späten Jahrzehnt des 16. Jahrhunderts mit Picchis Veröffentlichung der Intavolatura di balli d’arpicordo bestätigte. Die Originalausgabe hat nicht überlebt, ihr Inhalt ist jedoch aufgrund der venezianischen Wiederauflage aus dem Jahr 1621 bekannt. Picchi hat sein in der Widmung gegebenes Versprechen an die Leser, „vier Tanzbücher, die ich drucken lasse, sobald ich sehe, daß dieses erste Buch Zuspruch findet“, nicht eingehalten. Womöglich war die Nachfrage für landeseigene Klaviermusik im Venedig des frühen 17. Jahrhundert nicht stark genug, um so ehrgeizige Pläne fortzuführen. Wie auch immer, zu den von Picchi veröffentlichten balli zählen eine Vielzahl reizvoller, oftmals gewagter Stücke wie die sogenannten polnischen, deutschen und ungarischen Suiten. Der Ballo Ungaro, hier auf der Harfe gespielt, liefert einen unschuldigen und unbezwungenen zweiteiligen Tanz mit anmutigen Begleitvariationen. In der Padoana ditta la Ongara bedient sich Picchi eines auf drei verschiedene, doch ähnliche Oberstimmen aufbauenden Generalbaßes, über welchen er sein Talent zur Kreation schneller und reizvoller Abschnitte zum Ausdruck bringt. Der „ungarische“ Ursprung beider Stücke ist unklar, dennoch ist es eine durchaus verlockende Vorstellung, daß das durch Evelyn beschriebene Karnevalstreiben durch die rhythmische Energie der Padoana zusätzlich an Leben und exotischer Leidenschaft gewinnt. Vier Jahre nach der Veröffentlichung der zweiten Ausgabe der Intavolatura wurden Picchis Canzoni da sonar con ogni sorte d’istromenti in Venedig veröffentlicht. Das Werk umfaßte neun Stimmhefte und war höchstwahrscheinlich für Kirchenzwecke bestimmt. Diese Instrumentalwerke sind in fünf Gruppen unterteilt: in zwei, drei, vier, sechs und acht Generalbaßpassagen. Aus keinem ersichtlichen Grund wird jede Schlußkomposition dieser Gruppen mit „Sonate“ betitelt, obwohl die für sie begleitenden Kanzonen formalen und stilistischen Merkmale beibehalten wurden. Unterteilungen wurden in diesen Werken nicht durch Tempoangaben in der Weise Castellos vorgenommen, sondern durch Änderungen des Takts von Zweiertakt in Dreiertakt und umgekehrt. Picchi hat die Instrumente für viele seiner Kanzonen vorgeschrieben, wodurch er einige interessante Kombinationen kreiert hat, wie z. B. die Kanzone Nr. 15 mit ihren vier Posaunen und zwei Violinen, ein Werk, das in manchen Stimmheften verwirrenderweise als „Sonate“ bezeichnet wird. Die Komposition des Posaunenparts besticht sowohl in diesem Stück als auch in der achtstimmigen Kanzone Nr. 17 durch seine Klangfülle. In dieser Aufnahme wurde letzteres Werk, für zwei Instrumentenchöre, entgegen der Originalschlüsselung um eine Quarte nach unten transponiert, was durch seine Konfiguration als „Chiavette“ (Für nähere Informationen hierzu sowie zur Transposition siehe Arthur Mendels „Pitch in western music since 1500: A re-examination“, Acta Musicologica, 50 (1978), 58–62) möglicherweise beabsichtigt war. In diesem Stück sind Züge der Kanzonen Gabrielis zu erkennen, insbesondere die einfachen homophonen Wechsel, die den Abschnitten im Dreiertakt an Charakter verleihen und die innerhalb der gesamten Komposition vorherrschenden antiphonalen Wechsel sowie die mosaikhafte Anordnung der oftmals kurzen Gegensätze. Eine weitere spekulative Behandlung erfährt die Kanzone Nr. 18 dieser Aufnahme, die in der Veröffentlichung von 1625 als Werk für zwei vierstimmige Chöre erscheint. Transkriptionen polyphoner Kompositionen für Tasteninstrumente wurden zur Renaissance und bis spät in das 17. Jahrhundert hinein routinemäßig vorgenommen, während die Verfügbarkeit von mehr als einer Orgel in den reichsten venezianischen Kapellen und Kirchen der damaligen Zeit einen weiteren Beitrag dazu geleistet hat, daß die vorletzte Kanzone aus Picchis Buch für zwei Orgeln umgeschrieben werden konnte. Der Generalbaßpart der sechsstimmigen Kanzone Nr. 14 wurde ebenfalls für zwei Orgeln aufgeteilt, wodurch die Gegensätze der von Picchi geschaffenen Kombination zweier Kornetts und Posaunen verstärkt zum Ausdruck kommen. L’intrigo e il mistero venivano considerati virtù dagli abitanti della Venezia dell’inizio del Seicento, praticati e perfezionati com’erano da aristocratici e popolani, ed elevati a forma d’arte dalla polizia segreta della città. Una contemporanea incisione in legno di Francesco Pianta, tra i tesori della Scuola di San Rocco, sottolinea l’atteggiamento furtivo di una tipica spia veneziana, con l’identità completamente celata sotto mantello e cappello. E’ un paradosso della storia della Serenissima che i dettagli della vita di Dario Castello rimangano oscuri, anche se invece esiste tutta una dovizia di testimonianze d’archivio su musicisti le cui composizioni non possono rivaleggiare con i suoi lavori colti e anticipatori. Il nome Castello era, ed è ancora, comune a Venezia; anzi, sembra che una famiglia di musicisti di questo nome servisse il Doge e altri patroni veneziani nella prima metà del Seicento, e forse prima. Le documentazioni dei pagamenti e dei censimenti, i contratti e i necrologi di quel periodo citano tre strumentisti di nome Castello, che erano quasi certamente imparentati: Bartolomeo, Giovanni Francesco e Giovanni Battista. L’ultimo tra questi venne assunto come membro del gruppo di sei strumenti a fiato, o piffari, del Doge, dal 27 dicembre 1624 al 15 novembre 1633, e venne registrato negli archivi di San Marco come figlio di «Dario da Venezia, musicista nella nostra succitata cappella». La musica di Castello e la storia delle sue pubblicazioni offrono una chiara testimonianza delle sue qualità creative e della sua statura di compositore di notevole influenza. Il volume del 1621, che comprende dodici lavori, presenta la prima raccolta mai composta interamente di sonate strumentali; allo stesso modo, i diciassette brani pubblicati nel 1629 sono anch’essi esclusivamente delle sonate. Qui Castello riprende degli elementi della tradizionale canzona veneziana a più voci, dei passaggi di scrittura virtuosistica per i solisti, e degli scambi concertanti tra numerosi esecutori, introducendoli con successo in ampi lavori per un numero inferiore di strumenti. Anche se queste sonate sono composte in un «movimento» senza soluzione di continuità, Castello introdusse delle chiare indicazioni di tempo, come adasio, alegra o alegro e presto, per metterne in rilievo le suddivisioni formali e gli umori contrastanti. La Sonata n. 8 dal Libro II, per esempio, contiene sei cambiamenti di indicazioni di tempo o metro. Questo lavoro è tipico dell’unione del vecchio e del nuovo: il contrappunto a imitazione della sezione di apertura ricorda le canzoni di Giovanni Gabrieli, mentre il virtuosismo che pervade l’espressivo movimento centrale Adagio indica la via verso futuri sviluppi nella scrittura strumentale veneziana. Le sezioni lente nella magnifica Sonata n. 13 dal Libro II confermano la potenza dell’immaginazione melodica del compositore, messa in rilievo da dei punti di imitazione ben articolati e da eloquenti ritardi, mentre l’attenzione dell’ascoltatore viene tenuta impegnata altrove dalla varietà e dal virtuosismo della scrittura. Se venne assunto a San Marco qualche tempo dopo la pubblicazione del suo Libro I e prima del lavoro iniziale di composizione a stampa sul suo Libro secondo nel settembre 1627, è probabile che Dario Castello abbia conosciuto e lavorato con il maestro di cappella della Basilica, Claudio Monteverdi. I due compositori mostrano di quando in quando delle caratteristiche comuni, con Castello che in parecchi dei suoi lavori strumentali adotta i drammatici effetti delle note ribattute e del tremolo propri dello stile concitato, e, al pari di Monteverdi, invita il fagotto a emergere dai ranghi del basso continuo e a eseguire dei brevi assoli. Il fagotto, o dulciana, un membro importante e stimato delle bande di fiati di Venezia, viene specificamente indicato in numerose sonate di Castello. Il suo affettuoso rispetto per lo strumento è percepibile nei passaggi virtuosistici che il musicista creò appositamente, per esempio nella Sonata n. 8 dal Libro II, dove la dulciana si impegna in un dialogo contrappuntistico con la cornetta, emulandone l’ardita scrittura. Castello si prese cura di specificare la strumentazione o le possibili permutazioni strumentali in molte delle sue sonate, con cornette e violini prescritti per le voci acute, accompagnati da una scelta di tromboni, fagotto e strumenti per il basso continuo. La Sonata n. 14 dal Libro II chiude con una sezione finale lenta in forma di fantasia, dove la scrittura polifonica a incastro per due cornette e due tromboni produce un effetto estremamente drammatico. In questa sonata vengono sfruttati in maniera intelligente i contrasti tra gli strumenti acuti e quelli gravi, e gli scorrevoli duetti e vivaci motivi fugati ne mettono in straordinario risalto lo stile vocale. Ma è nella Sonata n. 17 dal Libro II che Castello rivela la sua abilissima capacità di manipolare l’ordito strumentale, accoppiando due cornette e due violini, e invitando uno strumento per ciascuna coppia a fungere da voce secondaria in eco. L’edizione per l’esecuzione usata in questa registrazione sceglie di omettere il rigo superiore della parte del basso continuo, che, nella pubblicazione originale, reca una versione semplificata delle parti eseguite dai due strumenti acuti. Gli effetti di antifona presenti in precedenti canzoni strumentali di grandi dimensioni vengono qui distillati in un lavoro di proporzioni cameristiche o da cappella privata, grandioso nella concezione eppure intimo nell’espressione. Un equilibrio simile tra sfoggio solistico e intimità d’insieme viene raggiunto nelle Sonate n. 10 e n. 11 e nella Sonata n. 5 a due voci, tutte tratte dal Libro secondo di Castello. Anche se gli esiti di compositore di Giovanni Picchi sono oscurati da quelli del suo contemporaneo Castello, la sua carriera può almeno venire descritta a grandi linee grazie al fatto che ci sono pervenuti materiali d’archivio e altri documenti di grande importanza. Picchi passò la maggior parte della sua vita nel sestiere veneziano di S. Polo, dove contribuì anche ad allevare sei figli, servendo come organista nella chiesa di Santa Maria de’ Frari dal 1606 circa fino alla sua morte, avvenuta il 19 maggio 1643. Nel 1623 Picchi succedette a Giovanni Battista Grillo, morto da poco, come organista della vicina confraternita della Scuola Grande di San Rocco, un incarico ricoperto in precedenza anche da Giovanni Gabrieli. I compiti dell’organista presso la Scuola vennero codificati nel 1588: presenza alla Messa e ai Vesperi in ventiquattro festività; alla Messa ogni prima domenica del mese, esclusi Avvento e Quaresima; ai Vesperi ogni domenica e alla Compieta ogni venerdi. Picchi doveva anche organizzare i musicisti per rappresentare la Scuola negli elaborati trionfi, le processioni del doge nella città. Nel 1624 il musicista venne invitato a competere per il posto di secondo organista a San Marco, anche se i procuratori della Basilica decisero invece di eleggere Giovanni Pietro Berti. Prima di assumere l’incarico di musicista in servizio nella chiesa e nella scuola, Picchi si affermò come compositore ed esecutore di successo di musica di danza. Un’incisione sul frontespizio del manuale di danza di Fabritio Caroso, Nobilità di dame, pubblicato nel 1600, mostra Picchi mentre suona il liuto assieme ad altri tre musicisti; Picchi era anche noto come ottimo clavicembalista. La Toccata, un brano di grande slancio improvvisatorio, venne copiato scorrettamente da Francis Tregian il giovane, per includerlo nel Fitzwilliam Virginal Book, e deve perciò risalire a prima della sua morte nel 1619. Le circostanze e l’itinerario della trasmissione del lavoro dall’Italia settentrionale alla cella di Tregian nella Fleet Prison di Londra, dove venne composta l’antologia Fitzwilliam, sono incerte, anche se è chiaro che il copista ne aveva a disposizione una versione corrotta, o che quanto meno fraintese la notazione originale di Picchi. Per questa registrazione Timothy Roberts ha seguito il precedente stabilito dall’edizione del Fitzwilliam Virginal Book di Howard Ferguson, correggendo errori ovvi e riproponendo la chiusura della sezione finale della Toccata nella tonalità di Re, piuttosto che in quella, meno soddisfacente, di Sol della versione di Tregian. Nel suo autorevole manuale, Caroso citò Picchi tra i «professori di ballare», un titolo confermato alla fine del primo decennio del Seicento dalla pubblicazione dell’Intavolatura di balli d’arpicordo. L’edizione originale non ci è pervenuta, anche se il suo contenuto ci è noto attraverso una ristampa veneziana del 1621. Picchi non riuscì a mantenere la promessa, contenuta nella dedica, di fornire ai lettori del volume altri «quattro libri di danze che stamperò quando vedrò che questo primo libro dimostra di piacere al pubblico». Forse nella Venezia dei primi del Seicento non c’era abbastanza mercato per la musica domestica per tastiera da sostenere una serie tanto ambiziosa di pubblicazioni. In ogni caso, i balli pubblicati di Picchi comprendono un quantità di pezzi eleganti, spesso avventurosi, tra cui delle cosidette suite polacche, tedesche e francesi. Il Ballo Ungaro, qui eseguito sull’arpa, rappresenta un trattamento spontaneo e senza forzature di una danza bipartita, completa di eleganti variazioni di accompagnamento. Nella Padoana ditta la Ongara, Picchi fa uso di un basso ostinato costruito su tre motivi distinti eppure simili, sopra cui il musicista mette in luce il suo talento nella creazione di rapide e raffinate fioriture ritmiche. La provenienza «ungherese» dei due brani non è chiara, anche se ci piace immaginare che l’energia ritmica della Padoana aggiungesse vita e passione esotica ai rituali carnevaleschi descritti da Evelyn. Quattro anni dopo la pubblicazione della seconda edizione dell’Intavolatura, vennero pubblicate a Venezia le Canzoni da sonar con ogni sorte d’istromenti di Picchi, con il contenuto stampato in nove spartiti e quasi certamente destinato all’esecuzione in chiesa. Questi lavori strumentali sono organizzati in cinque gruppi, per due, tre, quattro, sei e otto voci con basso continuo. Non è chiaro per quale ragione la composizione finale di ogni gruppo riceva il titolo di «sonata» pur mantenendo le stesse caratteristiche formali e stilistiche delle altre canzoni del gruppo. In questi brani le suddivisioni in sezioni non recano indicazioni di tempo come nei lavori di Castello, ma dei semplici cambiamenti da ritmo binario a ternario e viceversa. In molte delle sue canzoni Picchi prescrisse gli strumenti da usare, creando una quantità di combinazioni interessanti, come i quattro tromboni e due violini impiegati nella Canzona n. 15, un lavoro indicato ambiguamente come «sonata» in alcuni degli spartiti. Qui come nella Canzona n. 17 la scrittura per i tromboni è particolarmente ricca. In questa registrazione, quest’ultimo brano, per due cori strumentali, è stato trasportato una quarta sotto dalla tonalità dell’originale, che era forse l’intenzione dell’autore per come emerge dalla sua disposizione di cosidette «chiavette» (Per una spiegazione delle chiavi e ulteriori informazioni sul trasporto v. «Pitch in western music since 1500; A re-examination» di Arthur Mendel, Acta Musicologica, 50 (1978), 58–62). In questo brano vengono alla luce alcuni aspetti delle canzoni di Gabrieli, specialmente nei semplici scambi omofonici che danno carattere alle sezioni in ritmo ternario, nella scrittura antifonale che pervade l’intera composizione e nella disposizione a blocchi e incastri delle sue brevi sezioni, spesso ricche di contrasti. Un altro trattamento basato su congetture è stato qui usato per la Canzona n. 18, che nella pubblicazione del 1625 appare come un lavoro per due cori a quattro voci. Le trascrizioni per tastiera di composizioni polifoniche furono comunissime per tutto il Rinascimento e fino al Seicento iniziato, mentre la disponibilità di più di un organo nelle più ricche cappelle e chiese veneziane del periodo attribuisce legittimità anche maggiore all’arrangiamento per due organi della penultima canzona del libro di Picchi. Anche la parte del basso continuo della Canzona n. 14 è stata suddivisa tra due organi, a sottolineare il contrasto creato dall’unione di due cornette e tromboni operata dall’autore.